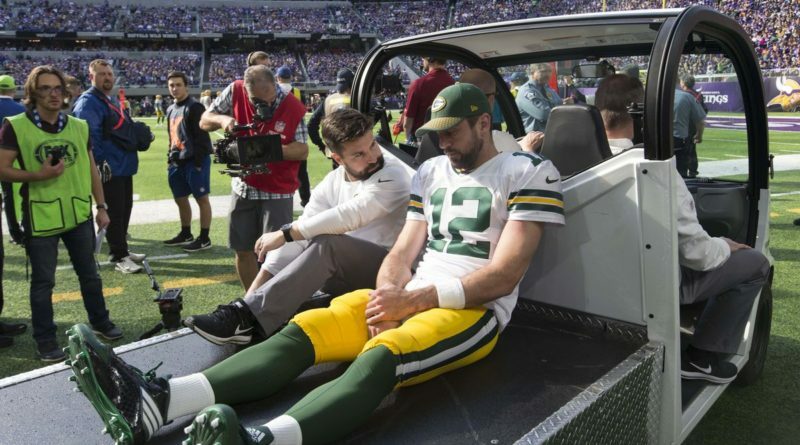 The Packers were 4-1 and Aaron Rodgers was playing some of the best football of his career when Anthony Barr injured the MVP-caliber quarterback. On a play action pass, the Minnesota linebacker hit Rodgers after he had already thrown the ball. Landing awkwardly, Rodgers broke his collarbone and was placed on IR, meaning he’d be eligible to return week 15. Since the injury, the Packers are 1-5 under the helm of Brett Hundley. Rodgers has been seen throwing 50 yard passes as of week 12 and is recovering quickly. Clay Matthews spoke up and said Rodgers shouldn’t of been put on injured reserve as he is looking extremely healthy. The Packers playoff hopes aren’t looking too good, and that is a direct result of losing their best player. Less than six minutes into the opening night of the season against the Cleveland Cavaliers, Hayward fell awkwardly after Kyrie Irving tossed an alley-oop. When Hayward came down, his left foot hit first and tucked underneath his body. When his ankle came into view of the Cavaliers bench, everyone immediately either covered their eyes or looked away. We now know that Hayward has suffered a dislocated and fractured left tibia. Hayward is expected to miss the 2017-18 season and time will tell whether or not he is ready to play in the postseason. A little bit more than a month has passed since his gruesome injury and Hayward is already back in the gym, working towards recovery. Regarded by some as the NFL’s best receiver, Odell Beckham Jr cleanly fractured his left ankle. As a result, OBJ needed surgery and is now out for the rest of the season. Giants wide receivers Dwayne Harris, Brandon Marshall, and Sterling Shepard also suffered injuries the same week. But Odell’s injury was by far the most detrimental. Passing yardage per game, as well as the Giants overall offense yards dropped an immense amount following his injury. In fact, because of all of the confusion and inefficiency in the Giants offense, Eli Manning was benched for Geno Smith. Rookie Deshaun Watson took over as the Houston Texans starting quarterback. By the time of Watson torn ACL, Watson was sixth in the league for passing yards, fourth in passer rating, and first for passing touchdowns (18). Wide receivers DeAndre Hopkins and Will Fuller thriving because of the rookie quarterback under center. Both were having their best seasons yet, but both performances dropped off after quarterback Tom Savage took over. At the time the Texans were in position for a deep playoff push, atop the AFC rankings. Since, the Texans have not won a single game. In the first quarter of the Patriots third preseason game against the Detroit Lions, Julian Edelman sustained a non-contact leg injury. After making a cut upfield, Edelman went straight to the ground and was then carted off the field for further evaluation. It is now confirmed that he has a complete tear of his ACL in his right knee and will miss the entire 2017 season. Over the past four seasons, Edelman has had 365 catches for 20 scores. However, his injury hasn’t stopped the Patriots from having an explosive offense. New Patriot, Brandin Cooks has had great success in the Patriots first twelve games with 886 yards and five touchdowns. Joe Thomas, aka NFL’s iron man, played 10,363 snaps consecutively up until his season ending injury. He ended up tearing his left tricep when attempting to block Brian Orakpo. But he made an astounding NFL record, and a virtually impossible accomplishment. He hasn’t missed a snap since his league entry and debut in 2007. Thomas created a milestone in the NFL and set the standard for the definition of durability and consistency. Although Thomas is an offensive lineman and the Browns are winless, he’s a pro bowler year in and year out. Maybe the NFL’s most impressive accomplishment of the 21st century, 10,000 consecutive snaps will probably stay in the record books for a long time. After just five games, J.J Watt suffers a brutal injury, ending his season. The three-time Defensive Player of the Year fractured the tibial plateau in his left leg. Following his injury, Watt tweeted, “I can’t sugarcoat it, I am devastated. All I want to do is be out there on that filed for my teammates and this city. I’m sorry.” Watt has suffered numerous injuries in the past, but no one has seen Watt in that much pain until this demoralizing injury. With the Texans star quarterback, Deshaun Watson getting injured, Houston’s season is basically over. The team is 4-8 with virtually no chance to participate in the playoffs. Los Angeles Clippers star, Blake Griffin could miss up to two months after a knee injury against the Lakers on Monday, November 27th. The Clippers won their third consecutive game but may have lost their season to collateral damage. Griffin was going for a loose ball in the paint with teammate Austin Rivers and Lakers rookie Lonzo Ball. Rivers then fell on Griffin whose knee twisted and hit the court. Griffin left the game shortly after. The Clippers are already missing guard, Patrick Beverley who is out for the season. They are now ranked tenth is the Western Conference with a record of 8-14. It will be a long rest of the season for the Clippers. At 19, 6’10, and game style of a guard, Michael Porter Jr serves as the perfect template for a future NBA combo forward.On virtually all NBA general manager draft boards, Michael Porter Jr is a top 3 recruit. The standout Missouri freshman will require and undergo back surgery, ending his basketball season early. Porter is an extremely versatile athlete who can score at any position on the court. He averaged 37 points as a senior in high school, so college basketball will miss a superstar this season and it will be interesting to see how Porter performs and where he decides to take his talents. After being the top fantasy running back last year, David Johnson was drafted top 5 on all boards. Poised for another touchdown filled year, Johnson’s season ended early and abruptly. He fractured his wrist, causing him to have surgery and be out for the rest of the NFL. As a result, the Cardinals signed veteran running back Adrian Peterson, but he hasn’t been able to fill that hole. Johnson is an amazing runner, as well as a great pass catcher, and his absence has surely been felt. With no hope of making the playoffs, and Johnson’s wrist still sore, he is expected to miss the rest of the season.